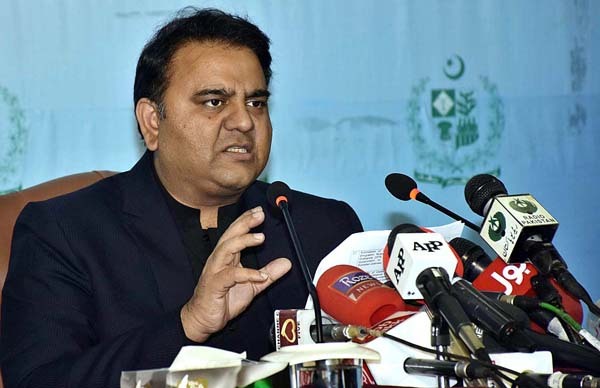 ISLAMABAD, Dec 20 (APP):Minister for Information and Broadcasting Chaudhry Fawad Hussain Thursday said the Federal Cabinet had directed the ministries to continue austerity measures and cut expenditures by 10 per cent as checking the government expenditure was crucial to overcome fiscal deficit. He was briefing the media persons about the decisions taken during the Cabinet Meeting, chaired by Prime Minister Imran Khan here. Fawad said a presentation was given to the prime minister on economic situation of the country, who has advised all the ministers to limit their foreign visits. The cabinet strongly condemned the ongoing genocide of Kashmiris by Indian occupation forces as well as imposition of Presidential Rule in the occupied state. The minister said that the prime minister would talk to the UN Secretary General by telephone about the worsening situation in Occupied Kashmir. Chaudhry Fawad Hussain announced that Crown Prince of Saudi Arabia Prince Muhammad bin Salman and Crown Prince of United Arab Emirates (UAE) Sheikh Mohammed bin Zayed bin Sultan Al-Nahyan would visit Pakistan in February and January respectively. During the Saudi Crown Prince visit, he said, an historic agreement on oil refinery project would be signed, which would be the largest foreign investment in Pakistan’s history. He said that the cabinet directed the interior ministry to remove the names of three persons including two MNAs Mohsin Dawar and Ali Wazir from the Exit Control List. He said that the prime minister expressed displeasure over no change in culture at the airports, as the expatriates and foreign investors continued to face the same problems they were facing in the past. The prime minister issued directive to Civil Aviation Authority and the interior ministry to change that culture. Fawad said that the cabinet decided that National Accountability Bureau, Federal Investigation Agency and Civil Aviation Authority were holding separate inquires into escalation of new Islamabad Airport’s cost and the cabinet directed that all those inquiries should be merged and a report be presented to the cabinet. He said that the cabinet gave approval for issuance of licenses and renewal of licenses for airlines including Pakistan International Airlines. He said that the prime minister issued directives that not a single penny cut would be imposed on the funds allocated for Federally Administered Tribal Areas as per agreement among the political parties 3 per cent of the GDP was to be allocated for FATA. Fawad regretted that the Sindh government of the Pakistan People’s Party, which claimed to be champion of the rights of small provinces was not cooperating on the issue. He said that the cabinet discussed revision of master plan of Islamabad and decided that master plans of major cities of Punjab and Khyber Pakhtunkhwa provinces would also be prepared. He said that the government would assure that the rights of the affectees were protected. The minister said that the government wanted to ease the visa regime to attract foreign tourists and investors. He said the Information Ministry had already approached the foreign and interior ministries for provision of facilities to foreign journalists. The minister said that Pakistan had spent $ 1 billion on the development of Afghanistan since 2002, and currently a 200-bed Jinnah Hospital in Kabul and Nishtar Kidney Centre in Lugar Province were being built. That policy was part of the compassion policy of the present government on the lines of Madina Munawara state led by the Holy Prophet (SAW). Replying to the media persons questions, he said that Dr Ishrat Hussain’s committee was working on restructuring plan and it would finalize its recommendations in due course of time, which would be implemented in phases. To a question about the PPP and PML-N announcement of joint strategy against the arrest of leaders, he said that it was a strange approach to join hands and demand pardon in corruption and plunder cases. Moreover, the masses had already rejected them, he added. Fawad made it clear that the government had no plan for retrenchment from government institutions. He said that the prime minister’s statement about new elections was reported out of context as he had only said that if a new province was created in south Punjab, elections for provincial assembly could be held there. The minister said the cabinet gave approval for appointment of members of Board of Governors of Deposit Protection Corporation, whereas services of Managing Director of Pak-Oman Company Bahauddin Khan were extended for three years. Fawad Hussain informed that the prices of medicines were also discussed in the cabinet meeting .